The pictures above are only a small reflection of the excitement these people experienced while churning through the sea in search of a fresh catch of fish. 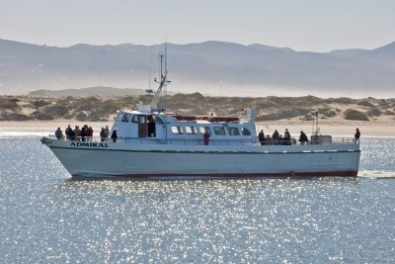 Each guest of Virg's Landing in Morro Bay is thrilled with the anticipation of fresh fish for dinner. Fresh Fish for dinner is expected when you go on a Private Charter or a Sportfishing expedition with Virg's Landing. 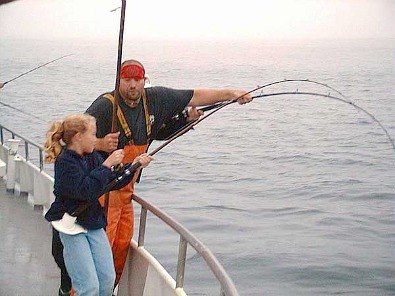 My wife and I love going out with Virg's and we also love the thrill of the catch. There is nothing better than the smell of fresh fish cooking on the grill while watching the sunset on the Pacific Ocean. Our over night Private Charters or Sportfishing excursions will allow you to experience the best of life. If you want to take your catch home that is no problem In fact our friendly deck crew will be glad to skin and fillet your catch for a small fee. The charge for cleaning your fish only cost $1.00 per fish. The price is subject to change on larger fish. Kids enjoy catching their own fish for dinner. Even grown kids enjoy the thrill of knowing they are fishing for their dinner. Regardless of your age fresh fish is always a delight, regardless of how you cook them. You can take them home and use your favorite recipe to create the perfect dinner. A little wine, fresh salad and freshly caught fish make for a great evening. Our boat fleet, captains and crew are the best on the Central Coast and they know how to catch fish for dinner. When you take a Private Charter with Virg's you are going to catch fish. 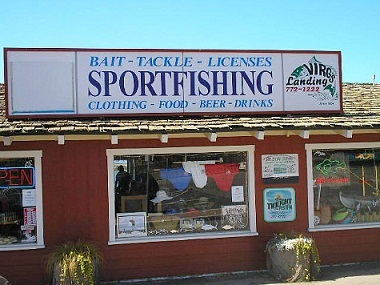 Kids love to fish and we love to fish and Virg's landing is the place to go if you love fish, especially fresh fish. What a Catch and What a Meal! What a catch! Can you imagine taking this home to your wife. You walk in the door and say, "honey I am home with dinner." She says, "I am not cleaning those blasted fish." You respond with a big smile, "you don't have to clean them Virg's took care of all that. All you have to do is cook em." For more information on fresh fish click here. 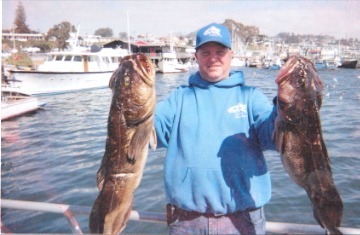 This link will take you to the best Sport Fishing Charters Company on the Central Coast of California.